I really enjoyed making this card. I just love this paper by Laura Ashley, it's part of the Love Song pack. I decided to go for a contrast color this time instead of tones within the same color range. The hot pink really works well with turquoise. 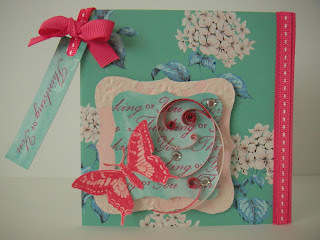 Butterflies and flowers always make a great theme for a card. I wanted to add a bit of movement to the card so I added a touch of quilling. So, starting with a square of white card I added the Laura Ashley paper to the base. On a separate piece of card I drew the ornate square shape and using watercolor paints gave this a pale pink color wash. I left this to dry. Then I added two sections from a paper doily to the top and bottom and cut it out to the shape of the square. I then made a smaller square on another piece of card and gave this a turquoise color wash. When that was dry I repeat stamped the text 'Thinking of You' on it in Rose Bud Ink. Using foam pads I attached the smaller square to the larger one and in turn added this to the bottom left hand side of the card. 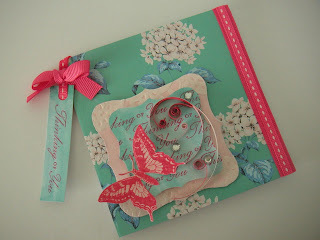 I stamped the butterfly in Rose Bud Ink on a piece of card with the same pink color wash. I carefully cut this out and glued it to the bottom left of the small square. I made some scrolls and double scrolls in two tones of pink quilling paper. I played around with the positioning of these until the composition looked right. On a piece of turquoise color washed card I stamped 'Thinking of You' in Rose Bud Ink, I cut this out to make a tag. I made a hole in the top of the tag using a hole punch. I attached it to the card with some pink stitched ribbon. A pretty card to brighten someone's day!